Asian Umami, in a hot sauce! 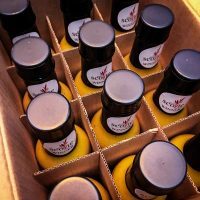 2nd Place winner of the 2019 Scovie Award Unique Hot Sauce category! Fatalii chili peppers bring a strong upfront heat, followed by citrus flavored hops from Bear Republic Brewing Co. Racer 5 IPA and combine with yellow Thai curry ingredients: ginger, galangal, garlic, coriander, cumin coconut milk and lime juice. This hot sauce is wonderful on chicken, tofu, eggs, seafood or pretty much any protein and great in a stir fry, ramen, pho, aioli or on a pizza slice with shrimp. 23 ingredients? It makes a difference! Nor Cal Mole | Yellow Thai Racer 2 Pack! 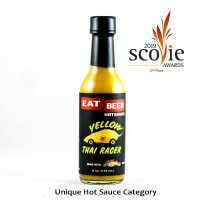 Can’t make up your mind on what Eat Beer Hot Sauce flavor to get, either Nor Cal Mole or Yellow Thai Racer? Then get both! This 2 bottle pack, one bottle of each flavor is a perfect way to stay stocked up and give as a gift to your friends and family members who love beer and hot sauce!